Talmadge Fire Safety Committee (TFSC) is a volunteer organization established to promote fire safety for all residents of Talmadge. The primary function of TFSC is to provide information to assist residents with fire safety awareness. TFSC is not an enforcement entity. Approximately 2 miles west of Talmadge, a fire fueled by heavy brush and strong winds raced up a series of Mission Valley canyons on June 30, 1985. 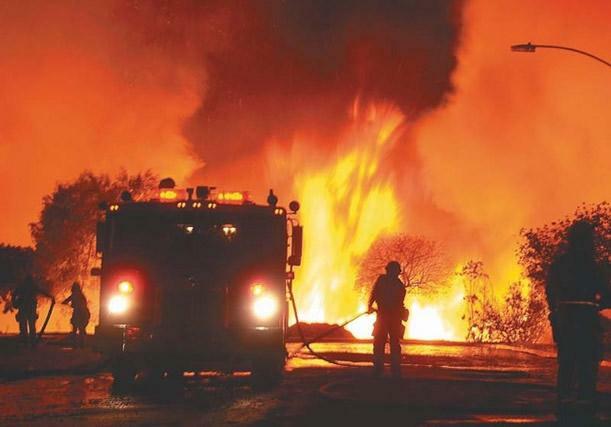 The Normal Heights Fire destroyed 76 houses and damaged 57 others. Heavy brush in the canyons and around the houses on the canyon rim propelled the fire. 1,000 to 1,500 people were evacuated. It was, at the time, the worst brush fire in San Diego history. The majority of Talmadge (north of Monroe Avenue) is located within the City’s highest fire hazard zone – Very High Fire Hazard Severity Zone. While the fire hazard is rated very high, an individual can reduce their risk of fire by following City fire safety codes, regulations, and recommendations. Fire hazard is based on factors such as fuel (material that can burn), slope and fire weather. Fire Risk considers the potential for damage based on factors such as the ability of a fire to ignite the structure, the flammability of the construction material, and mitigation measures that reduce the risk. These mitigation measures include defensible space, building design, ignition resistant building materials, and ignition resistant construction techniques. Per City of San Diego brush management regulations (see BULLETIN #1: BRUSH MANAGEMENT GUIDE), defensible space is the landscape between your house and the potential fuel source (dense stands of native or naturalized vegetation). Note that the defensible space is divided into two Zones. See the Bulletin for regulations within each Zone. The maximum dimension of Zone 1 is 35’. Zone 1 is not allowed on slopes with gradient greater than 4:1 (4 horizontal feet to 1 vertical foot). In general, Zone 1 extends from the edge of the structure to the top edge of the canyon slope (rear yard depth), or 35’, whichever is less. Zone 2 is the remaining distance to the allowable limits of brush management. The following table shows examples of Zone dimensions based on rear yard depth. The standard depth for defensible space in the City is 100′. However, due to a Fire Fuel Load report previously submitted to the City of San Diego Fire Chief, Talmadge canyon residents have an additional 50′ added to Zone 2 for a total defensible space of 150′. The increased defensible space requirement will result in additional protection for Talmadge residents. Note that brush management activities within coastal sage scrub, maritime succulent scrub, and coastal sage-chaparral habitats are prohibited from March 1 through August 15, during Gnatcatcher nesting season, except where documented to the satisfaction of the City Mayor’s Designee that the thinning and pruning would be consistent with conditions of species coverage described in the City of San Diego’s MSCP Subarea Plan. If the creation of defensible space requires thinning on adjacent properties, permission from the adjacent property owner must be obtained. If the adjacent property is owned by the City, a right of entry permit will be required. An application for right of entry can be initiated online here. According to the San Diego Fire Department, by far the most common source of fire in canyons is from human activity. Canyon slopes with pedestrian access and/or roadways at the bottom have the highest hazard. In these locations the fire source could be the result of accidental ignition from car fires, negligence in discarding cigarette butts or deliberate arson. In Talmadge, slopes adjacent to Montezuma Road, Fairmount Avenue, Aldine Drive and above Collwood Boulevard are in this category. The interior Talmadge canyon surrounded by Lucille, Caroline, Louise, Lorraine, Jean, Miracle and Natalie Drives, and a portion of Adams Avenue, does not have any roadways or authorized pedestrian access. However canyon Rim owners should be vigilant and report any unauthorized or suspicious people in the canyon to the 24 hour non-emergency police number (619-531-2000). Transient encampments are extremely dangerous and should be reported and removed as quickly as possible. For transient encampments on private property contact the property owner and also notify TFSC at firesafe@talmadge.org For transient encampments on City property or property with unknown ownership contact Chris Penman of City of San Diego Environmental Services for eviction removal and cleanup at CPenman@sandiego.gov or 858-492-6027. When contracting with anyone to perform work on your property you should verify the contractor’s insurance coverage. The following brush management contractors have been recommended by Talmadge residents. Residents that have used other contractors they would like to recommend may submit their information to firesafe@talmadge.org Please include as much of the following as possible: company name, owner name, contractor’s license number, address, phone number, email, and website. Company: Efren Duarte Landscape, Inc. Please note the accomplishments that the Talmadge Fire Safe Council has made in the past under the leadership of Kathy Finn.